The Dominican Republic is a small country in the Antilles Archipelago with a population estimated to be approximately 9.6 million, most of whom are under the age of 35. Nearly half of the population lives in poverty, and the number has grown steadily since 2002. The extensive poverty and a concentration of young citizens hold broad national implications. With so many of the population being both young and poor, a higher social vulnerability is problematic regarding such issues as child labor, commercial sexual exploitation and abuse, school desertion, homelessness, and addictions. The situation becomes even more complex as these problems further increase the country’s poverty level, which in turn makes even more people vulnerable. This resulting cyclic evolution creates a condition that rapidly erodes the entire national political, economic, and social structure. The unemployed population in 2000 was estimated to be 13.9% of the total productive population; that figure rose to 18% in 2004 and 2005. This situation was ascribed to the 2004 economic crisis. However, since 2005, there has been some improvement, reducing the number to 15.6% in 2007. The Gross Domestic Product (GDP) has increased since the economic crisis in 2003-2004. Although the GDP in 2003 reached negative numbers (minus 1.9), it increased to a positive 9.3 in 2005 but fell back to 5.5 in 2006. The overall social, political, and economic conditions in the Dominican Republic are severe. As a consequence, the Dominican Republic was selected to participate in this international investigative study to assess the ability of the public to access information and communication venues. The researchers also reviewed the role of information and communication technologies (ICTs) across the nation’s overall economic, political, and regulatory framework. The researchers assessed how the venues function, how they serve user needs, how they meet operational constraints, how they realize successes, and how they meet the needs of underserved communities and groups. 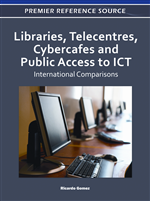 This study provided insight into the state of access to public information venues, and specifically considered public libraries, telecenters, and cybercafés, with a special focus on the social and economic inequities that affect the country regarding access to information sources. Consequently, the researchers set out to understand the information needs of underserved communities, public access to information and communication venues, and the role of ICTs. This study aimed to contribute research that would be a tool for policy and decision makers to plan, design, and develop projects in the field of information and ICTs.